Raprima is also my favorite Tempeh starter! I always order it from the same site (tempehstarter.com), very good and reliable quality! 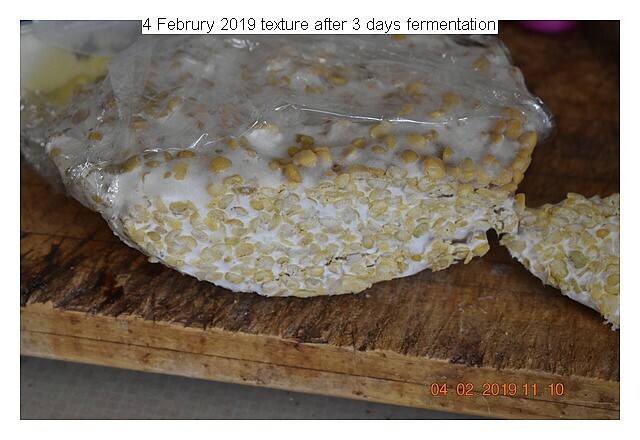 Very interesting, Tempeh fermentation at (non-tropic) ambient temperature! I never tried, but this would make the whole process much easier for many people. I always thought at low temperatures sporulation must be higher then normal. But you proofed the opposite! I got another batch brewing now. Using basically the same procedure. How the beans are cooked appears to hve some effect. Am still evaluating. Experimenting with fermenting lentils. These were fermented at room temperature 20C. The lentils need be a bit soft. This batch was cooked in the pressure cooker for about 35 minutes. The starter was mixed and the lentils were placed in a colander. The air holes are necessary. The colander was placed in a large pot and set aside to ferment for about 48 hours at rom temperature. Cooking to the right softness appears to be a variable. Two methods of cooking pressure cooker or boiling water. I have equal success by gently boiling for 40 minutes or pressure cooking at about 35 minutes. The beans should have their shape and be soft enough to crush with the fingers. Meaning not too mushy.